The mission of the Eos Foundation is to break the cycle of poverty by investing in children’s futures. We support organizations and systemic solutions aimed at nourishing children’s bodies, nurturing their minds, and building family economic security. ATB Breakfast is proven to boost school breakfast participation, fuel student learning, improve student wellness, and leverage untapped federal reimbursements to support improvements to school nutrition departments. In response to the January 18, 2019 notification from DESE we have simplified our grant application process. ATB Breakfast at Stefanik K-5 School in Chicopee. ATB Breakfast at Alfred J. Gomes Elementary in New Bedford. 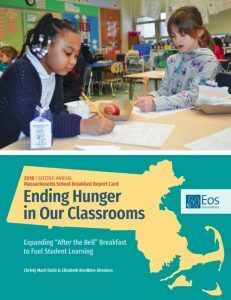 This report ranks the state’s 638 high poverty schools on their school breakfast participation rates – a measure of success for alleviating childhood hunger. Despite increases in school breakfast participation over the past three years, nearly 153,000 low-income students are still missing out on a nutritious morning meal each school day. By moving breakfast to after the bell when students are in attendance, everyone has equal access to the meal and participation soars leading to better academic and health outcomes for kids. If all high poverty schools adopted and ran optimal after the bell programs, they would draw down an additional $32 million in USDA funds to cash-strapped district nutrition departments statewide. We are now accepting applications for our $500 Healthy Start Award recognizing schools that have high rates of breakfast participation. Awards will be presented along with a $500 grant at the annual Healthy Start Award Ceremony at the Massachusetts State House. at least two consecutive months during the 2018-2019 school year. – Note: Schools who received this award previously are eligible to apply again. Applications for this award are due Thursday, March 7, 2019 by 5:00pm. School Principals in partnership with their district School Nutrition Director are invited to apply by completing this online form. Award recipients will be notified the week of April 1, 2019. For a full list of Healthy Start Schools please click here.